On this new installment of Writing The Ellipsis, a young boy spends his summer projecting his own narrative onto television shows. Back in the summer of 1990, I enrolled in a science and technology academy hosted by my elementary school. I learned how to balance a checkbook and understand the way banks worked. I designed and built a derby racecar using basic physics. I even went birding and paddled down a swampy canal scouting gators and other wildlife. For most of that summer, I attended these daylong workshops. I was ten years old and aware that I was a poor, smart brown kid bussed to an affluent, mostly white suburban school. This insight fed into my lack of enthusiasm. I wasn’t that interested in checks and balances when my family didn’t even have a bank account. I didn’t have the patience for putting together a soapbox car that eventually broke down on test day. I had some interest in ecology, but when it was revealed that our class was going scuba diving off the Gulf of Mexico, I shied away because I didn’t know how to swim. Even worse, I was deeply ashamed that I couldn’t afford a new pair of swim trunks. I spent that summer alone. The rest of my family worked long hours splitting their time picking fruit in a field or canning it in a factory while I attended the best and cheapest daycare. Off I went to learn and returned to an empty home with a few hours to kill. The first time we let out early, I was locked outside of my house. I found a way in by crawling through the kitchen window. I remember hovering over the sink with half of my body sticking out. I took in the way everything looked inside. I lived in a small brick home that was always dark and clammy despite the humid Florida heat. The walls were a cold gray and bare of any picture frames. This made the only thing that hung on display, a wall calendar my mother used to jot down work hours, pinned behind the backdoor, all that more austere. In fact, everything in the house gave off a random and utilitarian air. There was a table no one used set off to a corner, its mismatched set of chairs was strewn all over the living area. Some stood as corner pieces next to a musty couch that was so dilapidated it was more comfortable to sit on the cement floor. Another chair propped a small black and white television. I assessed it all in that awkward position I was in, my hands firmly on the sink and my feet dangling out the window. This is my home? I wondered. I tried laughing but instead let out a grunt. It was hard not to notice the absurdity in my action. I was breaking into a home—this home—my own home that never felt mine. Like a lot of the things in my life then, everything was temporary; everything belonged to someone else. There was a sense that I was living a life set behind the scenes, tucked away from public view. Even the house that I lived in was situated on a crusty dirt path called Old Hopewell Road. Tucked within a thicket of trees, my house was set aside from the migrant camp, which lay hidden farther behind. At that age, I equated my surroundings as indicative of identity. We were given that brick house, I assumed, because we were better than the other families and single men who were garrisoned into the barracks behind our house. I used to walk by that building on my way to school bewildered at why anyone would want to live crammed inside a place with no walls and little privacy. Lucky us, my family had a house that had a back porch where I sat and read books. We were the family of rank because of our U.S. citizenship, a step above the undocumented farm workers. This gave us privileges that the rest in the migrant camp did not. That’s how I saw my world. And yet, that day I broke through that kitchen window, I came to see my family wasn’t that special for having our own place to live. We were just an annex to an encampment disconnected from the outside world. The only privilege I had was that I could move freely between worlds. Old Hopewell paralleled the highway. I waited at the end of the dirt path every morning for my school bus that shipped me fifteen miles to my elementary school. On the way, I kept a low profile by looking out the window. But I was drawn to my bus mates and unwittingly compared myself to them. This made me turn to look every time the school bus stopped to let in a group of children. I was curious how they lived. 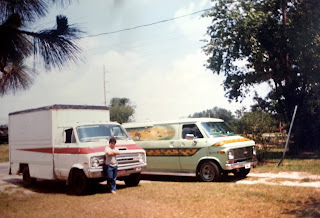 The bus route took us through the working class farming town of Plant City where I lived, then outward to the neighboring suburbs near Tampa-St. Petersburg. That route was reversed every afternoon and those lavish two-storied homes with the well-manicured lawns and the long driveways that served as basketball courts gave way to strawberry fields and orange groves folded into an array of modest doublewides and lowly trailer parks. Then we neared Old Hopewell, where I was dropped off. I walked all the way to its dead end, and stood for a moment at the hedge of the towering oaks covered in Spanish moss that enclosed the migrant camp, and disappeared. Everything seemed so established and secure for everyone else on my school bus. No matter the suburbs or the farm town, I imagined that all of the children led wonderful television lives. Every afternoon, they’d get home and walk through that unlocked front door where they were greeted by warm lighting and a massive round of applause. I came home those afternoons to that dismal brick house to plant myself on the cement floor to watch TV. Back then I couldn’t place my unhappiness. My despondency manifested into boredom, rooted in my family’s instability and made worse by those long hours I spent watching soap operas, sitcom reruns, and the local news. I was far too young to understand what was happening to me, within me. I was four years old when my parents sold everything and left Texas to join the migrant circuit. Right then I lost access to the normalcy and stability of an American childhood and entered the transiency and impermanence of migrant farm work, where life was dictated by harvest seasons. I moved around so much (sometimes three or four times a month) that I lost any childhood allegiance to home or school. Friendships were out of the question. I learned quickly that my mind was a refuge from this reality, like a survival mechanism, it was a way to avoid and make sense of that world. My invention of detachment and solitude became this: yes, I lived in my parents’ world but I kept my inner one secret. My childhood felt so illusory. I was aware I didn’t live a “normal” American life that way it had been afforded to others. I just didn’t know what it meant. My guess was that a real life was a scripted life. I saw television shows as emblematic of the way life should be lived. When nothing validated my family’s existence, I drew correlations that matched our narrative. My father became a detective just like actor A. Martinez on Santa Barbara. Oddly enough, my father had the actor’s strong and defined face that made him a dead-ringer for Martinez’s detective Cruz Castillo. Every morning, he’d wake up and made a breakfast cocktail of Coca-Cola with a raw egg (“Como los boxeadores,” my father said), then head out the door for work. I imagined him driving to a big city like Tampa or Miami to their police department to work on solving big murder cases. I began following the soap opera with a voyeuristic enthusiasm of a child eager to know more about what his father did at work. Then at the end of the day, when my father came home with a scowl on his face, marching straight to bed. I prided myself on knowing he’d had a long day solving murders while keeping his love life secret. Did it bother me that one of the show’s soapy storyline involved Detective Castillo’s secret love affair with a white woman, or that the affair was with another woman other than my mother? At the time, my mother had cut off her long black hair and permed it into a corona of curls that made her look like Vicki Lawrence’s Ma Harper on Mama’s Family, a comparison that brought cackles from my brothers and made our mother exit silently out of the room. In this life, that detail was of little importance. The Detective Castillo narrative—the poor cop, rich debutante—on Santa Barbra gripped me. Their machinations to first subvert the affair and then to have it surface in the face of the high society in Santa Barbara was the stuff that took weeks to sort out. So I started skipping my science and technology academy in order to keep tabs on my father. I’d walk to the bus stop, wait until the my mother and brothers drove past in our large work truck, then stroll back to the house and sneak back in through the kitchen window. WAYNE: What did you say? NARRATOR: This is the way most of my conversations with my brother Wayne ended. Apparently he just deeply regretted the fact that I had been born, and he wanted me to feel the same way. I shared the narrator’s sentiment. Back then I couldn’t have a normal conversation with my brother that didn’t end up in a fistfight. And because he was older and stronger than I was, he was always the victor. I flinched every time Wayne lorded his strength over Kevin. I didn’t know why it hurt me. It seemed unnatural. Then I realized that no matter how hard Wayne was on his brother, Kevin always counted on his girlfriend and best friend. I began disliking projecting myself into someone else’s narrative. Reality had broken through the fantasy and became hard to deny. Instead, I switched off the television and avoided watching the comforts I lacked. BROTHER: This IS IT. The house where we took that pic of us with our three mullets. Lol. ME: Wow. That’s not a house. That’s a hut. And yeah… wow. Earlier I said that as a child I saw my surroundings as indicative of identity. When I look at that photograph of the little house on Old Hopewell Road, I’m taken back to 1990, when I took solace in isolation inside that little hut. But loneliness has a way of making you yearn to be a part of something larger. What was a boy to do but search for a narrative on TV or inside books? ME: Hey, check this out. BROTHER: Hey, that’s my work truck! ME: Yeah. I listened to the Super Bowl on the radio that year ‘cuz dad had rented some Jackie Chan movie. Whenever I revisit The Wonder Years, I see things about it I missed as a child; new layers that have (like a good book) both enlighten and anger me. The adult in me understands how I saw myself in that show. It has such a finite moment in a boy’s life that would make anyone long to revisit over and over, especially if you had no life of your own. And yet today, I no longer find a connection to that world or that story. I have found my own. Scenes from the 1990's flash past. NARRATOR: 1990, I’m ten years old. A lot happened that year. The 49’ers won the Super Bowl, In Living Color hit the air, and I attended the Summer Science & Technology Academy at Pinecrest Elementary, sort of—but we’ll get to that. There’s no pretty way to put this: I grew up as a migrant farm worker. I guess most people don’t even know what a migrant is and what they do—or that farm workers even exists. In a way, you can say those really were the wonder years for us out there in the fields. But it was far from a golden age for kids. César Díaz teaches creative nonfiction at St. Edward’s University in Austin, Texas. He is a featured columnist at Essay Daily. You can read some of his thoughts here, here, and here. Also, sometimes he has things to say on Twitter.